The Dog in the photo below was feeling a bit hungry, and decided that a dog collar would make an excellent snack! You can see the metal ring of the collar in the x-ray, which required surgical removal. Our fully equipped x-ray department is always ready to aid in our diagnosis of your pet's condition, and handle emergencies on site. 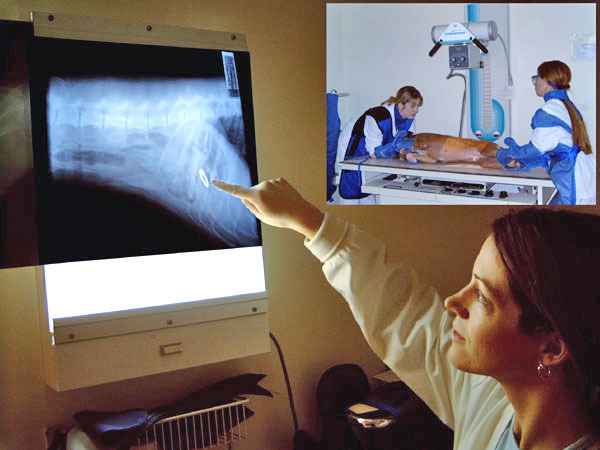 X-rays allow us to check on far more than just broken bones, and having the x-ray taken and developed on site means your pet gets the treatment it needs that much faster.